The business card may be the single most important marketing tool a company uses, but often, its importance is overlooked. We offer high quality printing of business cards in one color, two color, Pantone, and full color (CMYK). Whether you are printing only one lot or multiple lots for your business or organization, our affordable pricing and extreme printing quality will give your business cards the impact you are looking for. 1. 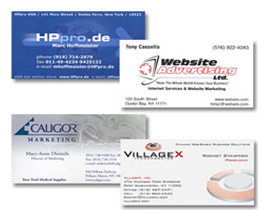 Select options for your business cards. 2. Add business cards to your list.